In the History of Rhinestones, Rhinestone Costume Jewelry share common "bling" elements with Vintage Costume Jewelry in the form of razzle dazzling little pebbles, originally found along the Rhine River. 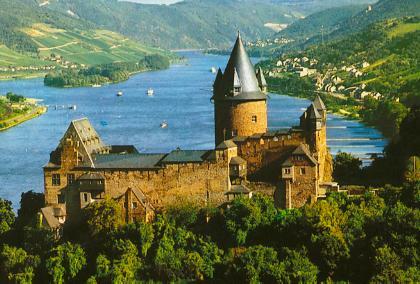 The Rhine River, is one of the most important rivers in Europe and in the late 1800s, it was filled with quartz pebbles in brilliant colors. It is from the Rhine River, that these little crystals, owe their name. As the natural, organic rhinestones, sourced from the Rhine River, were gradually depleted, imitation glass pebbles replaced them. Today, these "pretty pebbles" are sometimes referred to as "Sea-Glass" and Sea-Glass jewelry is gaining in popularity among wire jewelry artists today. Is "Paste" another word for Rhinestones, you may be wondering? Glass paste that simulated gemstones that do not cost the earth can trace its history much further back, to the Roman era and even further back still, to the magnificent jewelry of Ancient Egypt! However, Rhinestone Costume jewelry should not be confused with Antique Paste jewelry. A "foil" which is a metallic leaf of various colors, was sometimes placed under a clear paste or inferior gemstone to enhance its appearance. Fast forward to Austria, the country renowned for the revival of Rhinestones and in the glittering world of rhinestone costume jewelry, the name Swarovaski, an Austrian success story, stands alone. In the history of rhinestones, Mr Swarovski, in 1891, revolutionized the world of jewelry, with his invention of a new glass-cutting machine that could mechanically cut and facet glass. With his new faceting machine, faceted glass stones could now be created in a fraction of the normal time than before, when the stones had to be finished by hand. Swarovski then began making rhinestones with a 32% high lead content that produced faceted stones with refractions that were unrivaled. Daniel Swarovski, also created vacuum plating with silver and gold for the backs of the stones. Because a rhinestone may have a foil back, knowing the right way of caring for rhinestone costume jewelry is of the utmost importance. Swarovski jewelry uses only the highest quality rhinestones and swarovski beads are used by more than 85% of American jewelry companies. The name "paste" is often used or interchanged with rhinestone, in the history of rhinestones. Originally, glass paste was glass that was ground into a paste, molded then melted. The final piece was an opaque, dense glass with a frosted surface. Highly leaded glass on the other hand, was cut with facets to reflect the light. Paste was backed by a copper or silver lining. Leshner, L., Warman's Vintage Jewelry, Krause Publications, 2008, Ioloa, WI.